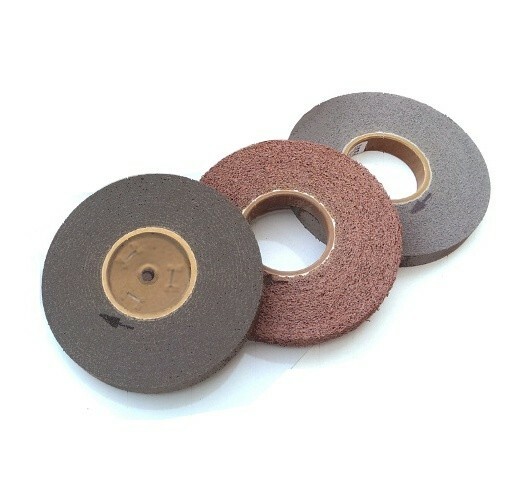 8"x1"x3" (200x25x76mm) Convolute (Deburring Wheels) are made of a unitized style non woven material which works well on ferrous and non ferrous metals. They offer consistent cutting throughout the lifespan, highly efficient ventilation for cool running, flexibility and resistance to clogging. Very similar to the 3M equivalent. Fibre centres allow wheels to be used on a tapered pigtail. Without fibre centres will fit straight on to an arbour. Convolute (Deburring Wheels) are made of a unitized style non woven material which works well on ferrous and non ferrous metals. They offer consistent cutting throughout the lifespan, highly efficient ventilation for cool running, flexibility and resistance to clogging. Very similar to the 3M equivalent. Softer densities such as density 5 are for wood and plastics. Densities 7 and 8 are best for deburring softer Steels and alloys. Leaving a fine finish.Used for refining shape and removing scratches. Popular With Tool Makers, Jewellers, fabricators, polishers, DIY polishing, Bikers, Car Restorers, Engine Porters, precision engineers.